Dubspot @ Electric Zoo 2010: Contest Winner Announced! Update: Check the bottom of the post for the winner! 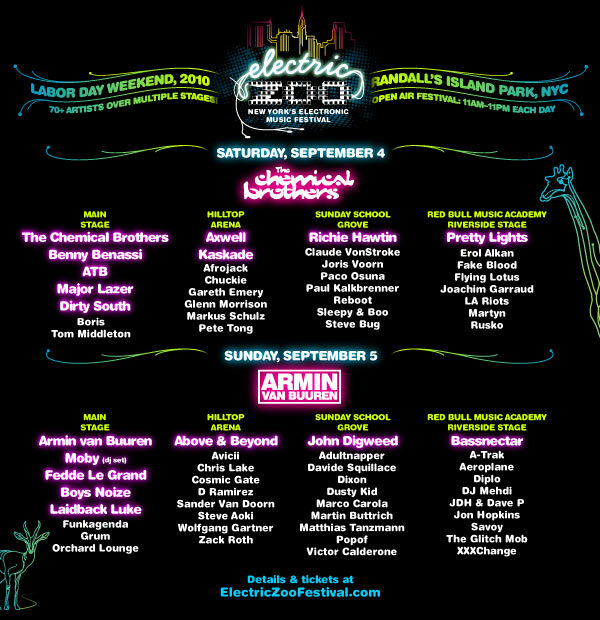 Electric Zoo, New York’s Electronic Music Festival is coming this Labor Day weekend on September 4 & 5, 2010. Following the success of its kickoff year, Dubspot would like to give one lucky person a chance to win a pair of 2 day general admission passes to the event. To enter this contest, simply leave a comment on our Facebook page: explain why you deserve to be at Electric Zoo this year, and we’ll pick the person with the best response. Good luck! The hugely anticipated 2010 edition brings together the highest caliber artists from across the many sub-genres of electronic music to New York’s premier open air festival. Festival headliners The Chemical Brothers and Armin van Buuren are joined by dance music legend Moby, Los Angeles beat mastermind Flying Lotus, UK dubstep superstar Rusko, West-Coast low-end champ Bassnectar, Los Angeles party-starters The Glitch Mob, and Berlin’s Boys Noize amongst over 70 others. Update: We’ve chosen a winner! Congratulations Daniel! Also, for all those attending Electric Zoo check out this new post about Jon Hopkins who will be playing at the festival. « Handmade Music NY: 7pm, Sunday, Aug. 29 @ Culturefix, FREE! Unfortunately, I was planning on going this year, but as of a couple days ago I got laid off, which has really messed up everything. Besides that, I have been listening to, creating, and drawing inspiration from electronic music my entire life. Some of my favorite big name acts are playing this year, along with a bunch of up and coming artists that I would love to see. This truly would be an amazing, and would give this week from hell a guiding light. i need the tickets cause i didnt go last year and and all my peeps rubbed it in my face. soo i deffently ned to go this year!